Several BookCon write-ups are in the works, including a recap, haul, and tips post. 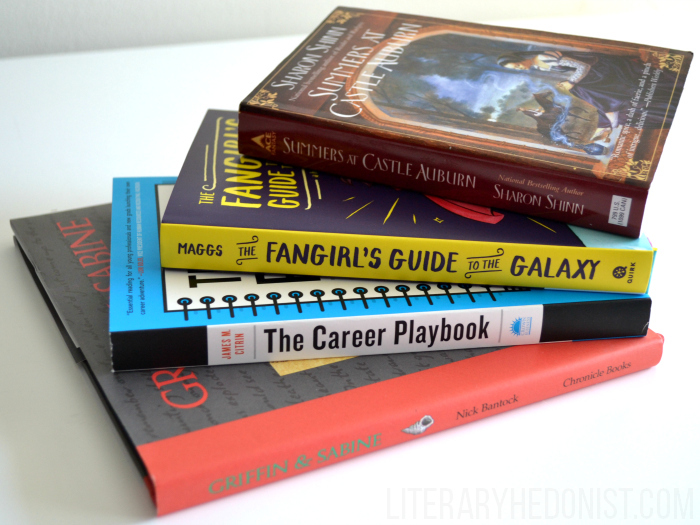 Until then, let me share with you the books I amassed during the two weeks before BookCon. I've wanted to read this book for years-- ever since I fell down the high-fantasy rabbit hole. I loved Sharon Shinn's The Shape-Changer's Wife, which I waxed poetic about over on this post of yore. When the manfriend said I needed to add some items to an order he was making so he could qualify for free shipping, I jumped at the chance to snag this little gem. I somehow talked the kind folks over at Quirk Books into giving me a copy of this gorgeous book so I could review it for Minerva Magazine-- you remember, it's the magazine I helped co-found. I'm reading the book now, and I'll cross-post my review here. I don't usually read non-fiction self-help books very often unless they really call to me or have reached critical acclaim. Not so in the case of this book. It was available on a book review site, and I chose it merely because pickin's were slim. I hoped it would help me along my career path somehow. Spoiler alert: it doesn't. Full review forthcoming. Another book courtesy of Jeff. I was so excited about these books (and still am), but now I have to figure out a proper reviewing schedule for them, considering the tons of books (many of them ARCs) that I received and promised to review at BookCon. Like I said before, I'm currently reading The Fangirl's Guide, and I just finished The Career Playbook today. Since Summers at Castle Auburn and Griffin and Sabine have been around for quite some time now, they are going to have to take a backseat to all the pre-releases. Which books have you been stacking on your shelves? Had to laugh at your comments about The Career Playbook. I'm the same when it comes to non-fiction or self-help books. There have been very few I've appreciated. It's so hard to find a good one, Deborah. Thanks for stopping by my post! Thank you so much, Lexxie! The BookCon posts are in the works. It's actually very exhausting to right them up, for some reason. Great haul. I need to check out some of these books. Have a great week. Thanks for stopping by, Megan! I'll check out your post next. Nice haul! I will look forward to your reviews, have a nice week! Thank you, Cindy! You too! So far, I really like it, Krystianna. I'll check out your post next! Looks like you will have lots of great reading ahead of you! I hope that you enjoy them all! Oh, I do. I have more reading to do than I have time for. But I will make it work, somehow! Thanks, Samantha! Too bad the career book didn't pan out! Have a great week. I know. I had moderately high hopes for it. Thanks for stopping by my post, Terri. I'll check out your blog next. Oh no! I don't think my comment posted. Darn. I love that photo! It's so nice and has white, books and nice typography, so I am basically in love. I'm sorry at least one of these wasn't as good as you had hoped. With being a reader and/or book reviewer there's a fair likelihood that a percentage of the books we read aren't going to be enjoyable or beneficial, but it's still disappointing when that happens, huh? I have been working on my book photography skills. I also love a lot of white space in book pics. And yes, we book reviewers sometimes roll the dice on books, especially on relatively unknown authors. But there's also the chance that we will be the first fans of a very talented and successful writer. Thanks again for visiting. I will be dropping by your blog soon! Summer At Castle Auburn sounds good. Very nice books this week. Thanks, Laura. I can't wait to read it, but who knows when that will be. I'll check out your post next! Sounds like you have some wonderful reads. Smiling at your comment about the self help book! Sounds like a good book haul Rosie! I've accumulated quite a bit of books myself but I'll hopefully knock out a few tomorrow as I read! These books look great! I can't wait to see your review of Summers at Castle Auburn because it looks like one I would like to read too!